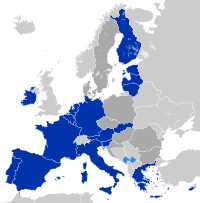 The Justice and Home Affairs Council (JHA) is one of the configurations of the Council of the European Union and is composed of the justice and home affairs ministers of the 28 European Union member states. JHA is composed of the justice and home affairs ministers of the 28 European Union member states. While most member states send one minister for both sectors, others send one minister for justice and another for home affairs. The European Commissioner for Home affairs and the European Commissioner for Justice, Fundamental Rights and Citizenship also participate in the meetings. The Justice and Home Affairs Council develops cooperation and common policies on various cross-border issues, with the aim of building an EU-wide area of justice. Cross-border issues include guaranteeing fundamental rights, free movement of citizens, civil protection, asylum and immigration matters, common investigations into cross-border organised crime, the EU's security strategy, including the fight against terrorism and organised crime, cybercrime and violent radicalisation. Since the entry into force of the Lisbon Treaty, the Council takes its decisions on most justice and home affairs legislation in co-decision with the European Parliament according to the ordinary legislative procedure. The work and tasks of the Council concerning justice and home affairs is prepared by the Directorate-General for Justice and Home Affairs. ^ a b c d e f "Consilium - Justice and Home Affairs". Council of the European Union. Retrieved 18 January 2014. This page was last edited on 27 October 2016, at 05:50 (UTC).